After High School Job – If you’re looking for a great career after high school and/or while you attend college, becoming a forklift operator is a wonderful option. 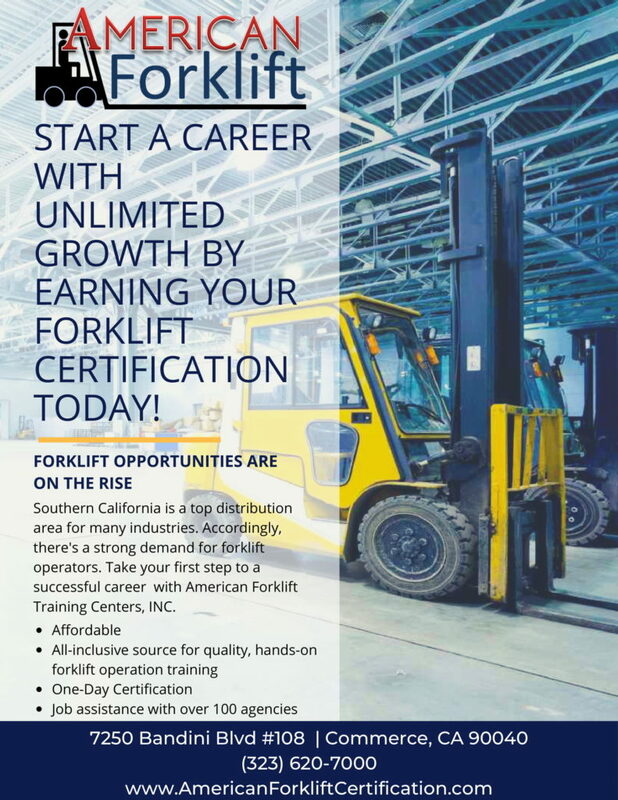 Reason being, the demand for forklift operators is high – and with American Forklift Training Centers, INC., entry into the field can be easy. If you read our previous blog, then you are aware that Southern California is in high demand for forklift operators. SoCal is a top distribution area for many industries. Accordingly, the necessity for forklift operators to help with distribution and fulfillment is on the rise. Companies require forklift operators to handle such essential duties of their fulfillment operations as: receiving, moving, pulling, distributing, storing, and documenting material and inventory. Additionally, forklift operators should assist in maintaining the forklift equipment, as well as making sure all aspects of the work is completed with utmost safety. We can’t stress enough how big and important of a role forklift operators have for these companies. Look at Amazon, a $160 Billion company (that’s with a ‘B’), wouldn’t haven’t been able to rise as quickly to the success it has, if it wasn’t for forklift operators to help fulfill and ship out their orders. Therefore, given the need for forklift operators, companies are not shy to pay employees what they’re worth. Furthermore, with shipping and warehouse being so crucial for a company, operating a forklift can be just the start of your career. Opportunities for growth from a forklift operator is exponential. Professionally, you can transition into such paths as a shipping/receiving supervisor, warehouse supervisor, warehouse manager, distribution manager, operations manager, and more, many of which can lead to six figure salaries. Performance over time, value added benefits provided, and versatility are some of the prime factors considered in advancing from the role of a forklift operator to a supervisory and/or managerial position. Take advantage of them and your wallet will thank you. Becoming a Forklift Operator Is Easier With American Forklift Training Centers, INC. When we launched American Forklift Training Centers, INC. in Commerce, we had one main goal in mind. We wanted to bring opportunities and success to the members of the community. Subsequently, we created an affordable and all-inclusive source for quality forklift operation training and certification. Moreover, our Forklift Training program is designed to not only provide you with the latest knowledge and training on forklift operations, safety, workplace hazards, driving & maneuvering, but upon receiving your certification, we will provide you with the tools, resources, job assistance, and connections to confidently know how to perform your job and find a career. At our Commerce location alone, we’ve partnered with over 100 companies and agencies to help graduates get a job. Upon completion, we forward graduates’ information to hiring agencies and companies, bringing opportunities to them. It’s as if you have 100+ agencies in your back pocket whenever you want. Although forklift certification is required to obtain a career as a forklift operator, no post-secondary education is required. That said, a high school diploma or GED, however, is preferred. This makes it easy for high school students to enter the field. And if you’re planning on attending college after, a career as a forklift operator is perfect if you’re looking for flexibility to balance going to work and college at the same time. Positions as a forklift operator are quite flexible. Night jobs, day jobs, 3 day shifts, 4 day shifts, etc…are all available. This is very fitting for a college student who needs to work and create the time to attend classes and study.